The snapshot below in Part 1 centers on make-believe and role-playing. But what about plain old rough-and-tumble play? Is there any value to rough-housing? Turns out that there is, but rough-housing can also be risky business. Rough and tumble play in particular is seen widely throughout the animal kingdom – it’s not just for human children. Immature species of animals play-fight and appear to enjoy it! Indeed, when it comes to animals in the wild, such play is of the utmost importance. Through play-fighting immature creatures learn how to survive in the wild, they learn what the limits of their abilities are, and they learn when to do what, and to whom (in hierarchical groups, it’s through rough and tumble play that the “alphas” are sorted out from the “betas”). When immature animals aren’t allowed to play, they do not show appropriate social nor survival behaviors in maturity. For many animals, rough and tumble play is vital to their existence. Is the same true for humans though? Can we adequately adapt to our environments (and importantly, to the challenges we face, therein) without first play-fighting with others? We do see rough-and-tumble play across the globe, and in particular with boys who, temperamentally, tend to have higher energy levels than do girls. Some parents maintain that rough-housing with their youngsters must happen, in order to help them get their energy out, and wrestling or play-fighting are regular parts of their routines. But what’s learned in this kind of play? True, roughhousing depletes energy stores and can be a great form of exercise, but what else does it do, and is it always advisable? Emotional scripting: teaching children emotion and internal-states words to associate with internal feelings and situations. Emotional scripting is a key ingredient for self-regulation and empathy. Appropriate behaviors: teaching children to know when and where roughhousing is OK. The key to ensuring that roughhousing remains healthy is close adult interaction and engagement. 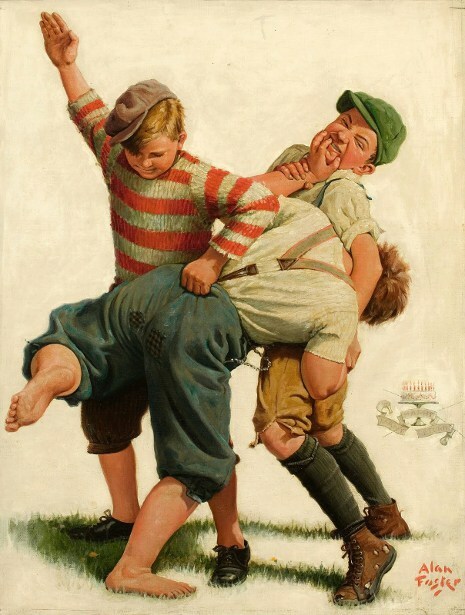 When roughhousing is fun and done so mindfully, it can be just as important to healthy development as fantasy play. But unlike fantasy play, when roughhousing happens without mindful adult debriefing, or without discussion of limits, self-control, nor perspective taking, then what’s learned from it can be quite detrimental to children’s social cognitive maturity. When adults don’t regulate the play, but rather jump in and out of it, missing or neglecting opportunities for “teachable moments” for fostering self-regulation and perspective taking, what happens? Even though the intent of such play may indeed be fun-loving and amicable, the wrong message can be internalized. It’s not just fun-and-games, as it turns out. All playful interactions with children – whether fantasy or roughhousing – have social cognitive implications. It’s during play that children establish and personalize scripts and schemas for “ways of being.” As discussed in part 1, preschool aged children internalize the patterns around them and use those patterns as templates to guide their own behavior. “Attachment Theory” shows us that the first templates for social interaction human children acquire become powerful baselines that guide behavior throughout life. When an adult’s actions are purely physical, so too will the child’s be. With no explicit model of how to play-fight respectfully, what kids learn is that you “fight” with those you love! As we know, when children play-out such scripts, they embellish them too. If at home during such play, children aren’t taught to attend to their play-partner’s emotions and reactions nor to control their own, then they aren’t likely to do that spontaneously when away from home either. To compound matters, when physical exertion is high, self-regulation is much harder. Experiencing a racing heart and adrenaline rush from a bought of rough-and-tumble takes up room in a child’s working memory stores – room that could otherwise be used to attend to a play-partner’s reactions or to regulate your own. In short, well intended but inadequately monitored roughhousing can teach active children to become playground bullies. When children’s experiences tell them that the way to get along is to play-fight and they do so, things can get rough on the playground and most young kids do not have the skills to spontaneously and peaceably deal with the fall out. Imagine for a moment how this can happen. Take a young child who has established a behavioral script for rough-housing and who hasn’t learned to attend to emotional nor situational cues while doing so. This child intends to be playful and walks up to another on the playground and starts to play-punch or to play-wrestle. The child on the receiving end misinterprets this as aggression and reacts in kind, leaving both children upset, neither understanding the other’s intentions. If such experiences happen repeatedly, it’s likely that the child who started it all could develop a hostile attribution bias. That is, over time, kids who don’t learn to anticipate nor read others’ emotions, may start to view the world with a chip on their shoulder. With a hostile attribution bias in mind, children assume that others are out to get them. This is how a bullying mindset can develop. So if adult-initiated roughhousing can have such dangerous consequences, should it stop all together? Is the dark side of rough-and-tumble play enough to advise against it? I really think “not.” But I have to make that statement with a cautionary corollary. That is this: if adults aren’t confident that they can appropriate embed self-regulatory or perspective-taking lessons into the play, then they shouldn’t do it. The risk of planting aggressive seeds is too great. But if adults are willing to engage mindfully and teach children to get their energy out respectfully, then the roughhousing can – and should – continue. I state it this way because we have to consider the possible cost of “no play.” That is, what happens, developmentally, when no play happens? Are humans like their counterparts in the animal kingdom, destined to be outcasts if not allowed to engage in play-fighting? To cite an extreme example, I recently skimmed a summary of a study of prison inmates (n = 26), where it was revealed through interviews of their life experiences that not a single inmate reported a normal childhood full of playful interactions. Rather, they painted pictures of austere and abusive experiences devoid of opportunities for rough-and-tumble or much less make-believe play. The results of the inmate interviews cannot be taken as definitive evidence that a lack of rough-housing causes children to grow to be criminals. Yet, the picture painted by the inmates eerily resembles what we’ve known to be true of non-human primates for many years now, thanks to the groundbreaking research of Harry Harlow and colleagues. In Harlow’s studies, the infant rhesus monkeys raised without a live mother for comfort did not develop normally at all – they were, among other things, inappropriately aggressive. Whereas parallel research cannot be done with human children (for obvious reasons), we can refer to the life-histories of individuals like those noted above and comparative research with animals to create reasonable guidelines for ourselves nonetheless. When we add in the research on fantasy play mentioned in part 1, it appears quite clear that there is a time and a place for play, and when play is done right, human children grow to become socially aware and appropriate. Counter-intuitive as it may seem on the surface, kids who play out mis-deeds end up showing more socially appropriate behaviors in the long run. Further, kids can learn important life lessons — self-regulation, emotional scripting and control and perspective taking – via play-fighting, with appropriate adult support. In this way, human children are not all that different from other immature animals after all. Where human children differ, of course, is with the ability to form schemas and scripts and that’s something adults must be aware of. Where to draw the line, then? Children really do need to play, but they need to play right and this can only happen with appropriate adult supervision and interaction. Adults who neglect to help their children learn to regulate during play-fighting are doing us all a disservice. In a day and age where an accepted rationale for cancelling recess is to prevent bullying, there is no excuse for mindless rough-housing. Rather, parents and caregivers a like should instead be thinking seriously about how they can best teach our youth to learn real life lessons of empathy and self-control while on the playground. Create a balanced schedule for kids that involves time for free play (fantasy, make believe, outdoor free play) interspersed with solitary down time (a little screen time, reading) and with structured activities like team sports, dance class, or music class. When fantasy play involves misdeeds, stand back and let it be (remember that contrast signifies understanding). When fantasy play leaves a child (or children) upset, step in and guide emotional regulation and perspective taking in an age-appropriate manner. Let energetic kids get wild, but not out of control. During roughhousing, deliberately remind children to attend to emotional signals in themselves and in others. No matter the children’s age, do not roughhouse without discussion about other’s feelings. The risk of unintentionally teaching kids to be aggressive is too great to ignore. Do not say “hello” in physical ways with very young children (play-fighting, sucker-punching, and the like). Only do that when children are old enough to understand more complex social expectations, for example, in the later elementary years at the earliest. I hope that this essay makes it clear that not all learning need be delivered in a curricular package. Some of the most important life lessons humans experience occur in the name of play. Not only that, but these lessons should occur in the name of play. There’s a time and a place for play, that is, play done right. Kleinknecht, E. (2013). A Time and a Place for Play, Part 2: Rough and Tumble in and out of the garden. Retrieved from http://wp.me/p282hY-af. I love that you highlight the many potential learning benefits of play, even roughhousing. But I think you underestimate adults’ and children’s abilities to learn from play *implicitly*…you seem to presume the learning can and must come explicitly if play is to be beneficial. But the extent to which learning can/does occur through play implicitly or explcitly is an empirical question, not one we should just presume the answer to based on our preset beliefs. One reason to think keeping things implicit can be better: Making things explicit can often undermine the playful nature of the activity, as can scheduling in play time regularly. “Okay, kids, it’s 7pm on tuesday, so you can roughhouse if you want! But let’s stop to talk about your feelings before, during and after” is just not authentic to what play is. Playfulness cannot and should not be scheduled and routinized to such a degree. Thanks for reading and taking the time to share your thoughts. I appreciate your perspective as well, and agree that implicit learning can and should happen. Indeed, I stand behind the ending remark that important life lessons can be learned spontaneously rather than through written curriculum. The main point of part 1 of the essay is just that – adults should stand back and let kids play out their own fantasies, no matter the content. But in the second part I make the point too that kids learn as they interact with each other and with adults whether we deliberately guide them or not — what you call implicit learning. Implicit learning happens everywhere, all the time. In the big picture, many adults don’t realize that they naturally do what I write about – they do interact with kids with a balance of playfulness and watchfulness and take advantage of teachable moments as they arise without missing a beat and keeping it light. Those are the situations where learning appears implicit, because it’s not being done on purpose, robotically, rather it just happens and the implicit lesson learned is indeed fun-loving and pro-social. However, as I state in my essay, there are cases too where the implicit lesson learned is not pro-social, and its that situation that many folks most fear right now (cancelling recesses to avoid such negativity or keeping children quiet, indoors and away from opportunities for roughhousing to avoid bullying). With that in mind, what I hope my remarks do is get folks thinking in a couple of ways: (a) to realize that roughhousing can be healthy, not a waste of time, nor a breeding ground for bullying; (b) to help folks realize that if they have or know children who are aren’t good at emotion regulation or perspective taking, that there are ways to help those kids mature while doing something fun! In short, I do not mean my words to be taken as a one-size-fits-all prescription for all, as it sounds like you took them. I do not mean to imply at all that life should be as scripted as you imply in your remarks – that’s just silly, and really beside the point. Rather, I put the information out there for folks to use if it strikes a cord with them. If the children in your life are implicitly learning to be happy healthy pro-social people, then hooray! I am delighted to hear it. But if they aren’t, then perhaps taking a little time to think about how you can explicitly manage the situation could be useful. Again, thanks for visiting. I hope my reply helps clarify my intent. Thanks for your thoughtful response! That definitely helps clear things up for me. You don’t disagree with the ubiquity and usefulness of implicit learning during play, but are making the point that if there’s evidence that this implicit learning is not pro-social then it may be time to become more explicit, right? That makes total sense to me. I guess it was a matter of emphasis I was taking issue with, but seeing your reasons for writing expressed more explicitly(!) helped me see why you placed a little more of the emphasis on explicit learning, especially in Part II (it also helped me see that you already do talk about implicit learning, more than I had picked up on an initial reading). I especially like what you say in your comment: “many adults don’t realize that they naturally do what I write about – they do interact with kids with a balance of playfulness and watchfulness and take advantage of teachable moments as they arise without missing a beat and keeping it light”. But now it’s clear to me that not everyone has this experience, and so it can be useful to have tools to help children learn through play, and a way to judge if they are learning good stuff (pro-social behaviors). Most of all, I love that you are bringing attention to the cognitive/social/developmental benefits of play (even rough-and-tumble-play!) and offering support for others to see this and engage it in too. Keep up the great work! Seriously though, glad you enjoyed the post! Thank you for your interest! I look forward to visiting your page as well. Cheers!